Congratulations to Ms. Boland and the Carrig School Music Group who have been selected as one of the 6 finalists of the Waltons School Music Competition. They will perform in the National Concert Hall in Dublin on Tuesday 7th May. This is a fantastic achievement for this very talented group, who have been very busy recently. They were featured on Ireland AM with their entry for the Schools Got Talent Competition. They also won the Slua Amhranaíocht le huirlisí ceoil competition in Féile An Aonaigh for the second year running. We wish them every success in Dublin on 7th May. Candidates for Confirmation will attend a Ceremony of Light this Sunday, April 7th in St. Mary’s Church Carrig @ 10 a.m. This is another step in their journey of preparation for receiving Confirmation on 17th May. The next step is the retreat in Roscrea which will take place on May 2nd. Chomhgairdeas le gach duine a ghlac páirt sa chomórtas seo le deanaí. Rang 3 agus 4 received a Teastas Ardmholadh in the Comórtas Aithriseoreachta A1. In the A2 competition Rang 3 came first and Rang 4 were joint first with Youghalarra N.S. D’eirigh go hiontach le Rang 5 agus a 6 freisin. Fuair roinnt acu Teastas Ardmhóladh i labhairt na Gaeilge. 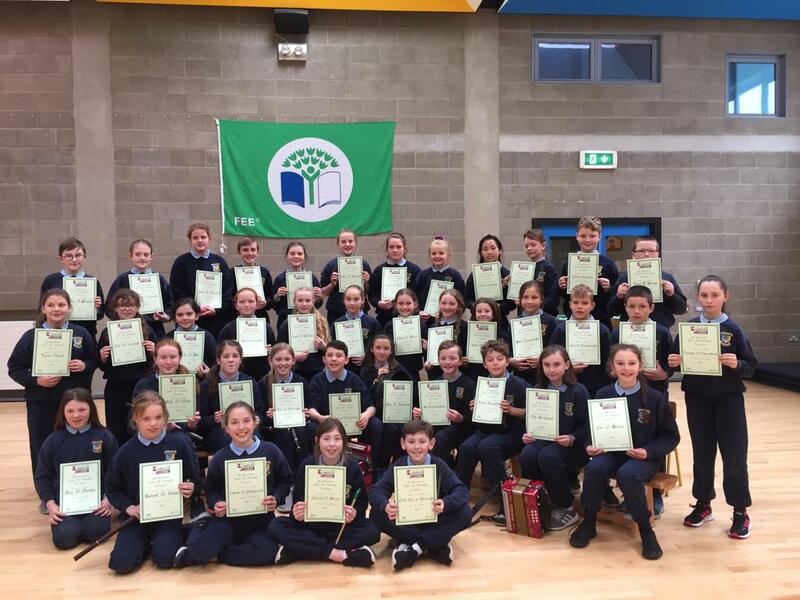 5th and 6th class were very successful again this year with several students winning certificates of commendation. Well done to the múinteoirí for their hard work in class preparing the children to such a high standard. Four girls in 6th class competed in the Munster Tennis competition in Waterford recently. They now progress to the shield competition. Well done to Ava Seymour, Maeve Kennedy, Katie Lynch and Cara McSherry. Sincere thanks to Ms. Maloney for coaching the girls and Fidelma Seymour for travelling with the girls on the day. Well done to our boys and girls soccer squads, who have both made it through to the County Finals. The girls’ finals are on 1st May and the boys play on 8th May. Both finals are in Two Mile Borris/St. Kevin’s FC. Our U11 boys participated in a blitz in Nenagh where they played Gaelscoil, Corville, and Nenagh C.B.S. Our U13 boys drew their first match versus Nenagh C.B.S. and play Gaelscoil next Monday 8th April in Nenagh at 1.00p.m. The U13 camogie girls will have their blitz in Templemore on 30th April. 2nd class blitz will take place in Kilcolman/Burgess GAA pitch on Wednesday 10th April at 10.30a.m. Jenny Fahy from NPC will conduct a workshop for parents in the school hall on Wednesday 10th April @ 7.00p.m. The talk will be preceded by a tea/coffee reception @ 6.45p.m. It is very important that all families in the school are represented at this event. Tá na páistí sna hArdranganna ag glacadh páirt sa chomórtás seo i láthair na huaire. The children in the Senior classes have been working hard on their filíocht, scéalta and Gaeilge Bhéil for Féile an Aonaigh this week. Ms. Boland’s grúpa will be in the slua –amhránaíocht on Monday 11th. Go n-eirí go geal leo go léir. Our girls squad travel to Ballymackey on 13th March to compete in the FAI 5 a side competition while the boys matches take place on 26th March also in Ballymackey. Matches commence at 10.00a.m. Congratulations to 2nd class who celebrated the Sacrament of 1st Penance on Thursday 7th March. Thanks to Ms. Byrne for preparing the children to receive this sacrament and to Ms. Boland, Mrs. Comer and the choir for their beautiful singing and music which really enhanced the ceremony. Sr. Essie, Diocesan Advisor will visit the school on Monday 11th March. She will visit each class to ta talk to the children about their Grow in Love programme. Ms. Laffan and the committee were visited by Catherine Broderick, Greenschools assessor to review their work to date and guide us in our application for the flag on the water theme. Olive Kilgannan visited the school recently and provided a workshop to 3rd class on Sean Nós dancing which the children thoroughly enjoyed. Senior Infants were treated to a P.E. class with Frank O’Keefe. Frank is hoping to hold his Multi-skills camp after school in Term 1 next year. The U13 camogie team will travel to Templemore on Thursday 21st March to play their matches in a blitz form. The U13 hurling team has 4 matches in their group starting with a match against C.B.S. Nenagh on 12th March @ 12.30p.m. The U11 hurlers’ competition is also in a blitz format with a provisional date of Monday 1st April in Nenagh C.B.S. pitch @ 11.30a.m. Some of the apps the children are using on the iPads require the children to wear headphones. We have some in the school but for hygiene reasons you may wish to supply one for your own child’s use.